Let our decals lead the way! 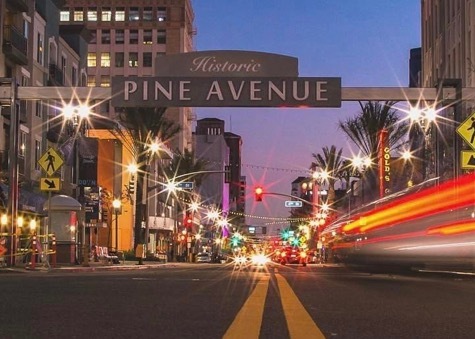 Visit our four distinct neighborhoods and explore the art and culture of Downtown Long Beach. Nothing about DTLB is typical. New here? Come see what we mean. See all the ways we’re helping Downtown Long Beach thrive. Explore our interactive map to find exactly what you’re looking for. Check out the performances, festivals and foodie delights happening in DTLB. Be a part of a Southern California success story, starting right from here. At the heart of an innovative, diverse city lies 1.38 Un-square Miles of unmistakable energy. Our cross streets are cross-sections of what makes Long Beach unique – people living, working, playing and discovering this great place together. To feel it for yourself, come on down. When you visit Downtown Long Beach, you’ll find a place that’s open. Open for business and for world-class meals and entertainment, absolutely. But also open to new ideas, outside perspectives and, of course, you. Come see why this slice of California heaven is made to be explored. We don’t have to sell you on location. Business does more than move through Long Beach; it stays here and plays a vital role in defining the region’s present and future growth. Now is the time to be a part of a scene that’s much more than just a spectacular view. DLBA has a passion for Long Beach. We believe there’s no better city in which to live, work, or raise a family, and Downtown is at the core of Long Beach’s resurgence. We work tirelessly on behalf of our tenants, businesses and property owners to promote our shared passion for this city and bring it to even greater heights. Downtown’s Unfiltered photography contest launched for its second year, providing an opportunity for novice and professional photographers to engage with the downtown area. California’s sixth-largest city is one of its most accessible. Downtown is designed with all modes of transportation in mind – we’re a walker’s paradise just as much as we’re a public transportation leader. Public Realm promotes a safe, vibrant and beautiful Downtown by developing and supporting programs and policies that foster a transit-, pedestrian-, and bicycle-friendly environment. If you blink, you’ll miss it. So make sure to follow us on Instagram @DLBA to keep up with the never-ending progress of Downtown Long Beach.